the USA. We recommend single reverse print for these flags, reads correct front side of flag and reverse image of back side of flag. Great Pricing, Quick Shipping and Large Qty Discounts. These Feather Flags need wind to keep the flag open. 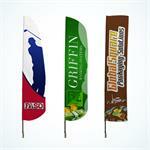 If you are looking for windless style flag, check out our Custom Blade Flags. Note : Save money by using pvc tubing or piping for flagpoles, rebar can be used as a ground spike. CUSTOM FEATHER FLAG, CUSTOM FLUTTER FLAGS, TRADITIONAL FEATHER FLAGS, TALL FEATHER FLAGS, RECTANGULAR FEATHER FLAGS, CUSTOM FEATHER BANNER FLAGS, WAVE FLAGS, CUSTOM SAIL FLAGS, CUSTOM TALL FLAGS.